Get some salmon steaks cut from the thickest part of the fish. Liberally season the fish after rubbing it with some oil to prevent sticking as some of the seasoning will stick to the grill. Place them on a hot grill, skin side down. After about two minutes turn the steaks one quarter turn and cook another two minutes. Then carefully flip the steaks over and repeat the process. 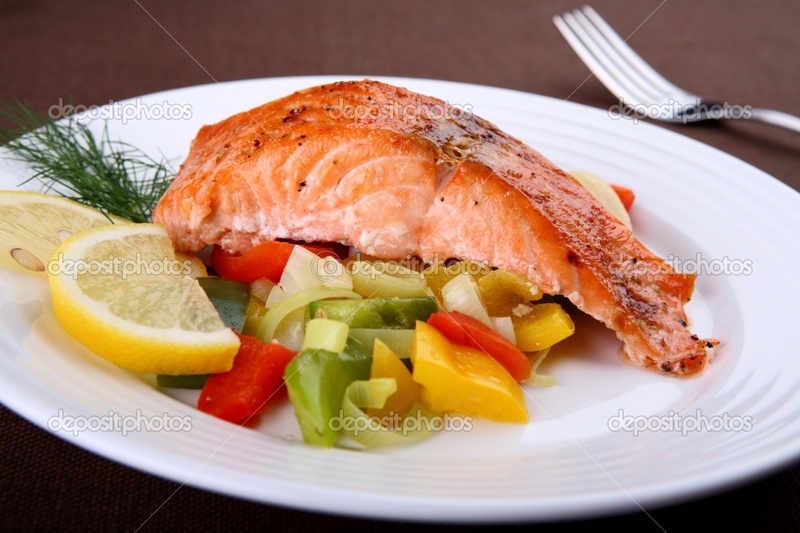 You should end up with a salmon steak cooked to about medium. Squeeze fresh lemon over the top and drizzle with olive oil. For the veg: Cut yellow and zucchini squash into any shape of chunks that you want. Dice an onion into large pieces. Cut up two stalks of celery and one clove of garlic. Cut up two whole carrots and saute’ them in olive oil for about three minutes before adding them to the other veggies to roast. Add a pinch of salt and some chopped fresh basil. Toss the ingredients and place in a baking dish. Roast at 450 degrees for about 25 minutes or until the vegetables begin to brown slightly around the edges. Serve with the salmon.